Imagine a college track coach not having a single home meet for 18 seasons, yet winning 11 consecutive conference championships in both indoor and outdoor competition. 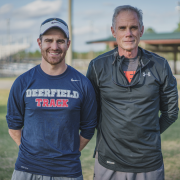 Meet Ron Grigg, head coach of the Jacksonville University women’s track team that has consistently been among the best programs in the Atlantic Sun Conference since the mid-2000s. During that span, JU has won 12 of 14 conference indoor titles and 11 of 13 outdoor crowns. For 11 successive seasons, 2006-16, Jacksonville captured both the indoor and outdoor ASUN titles. The Dolphins will go after another outdoor championship May 10-11 at the league’s outdoor meet held on the North Florida campus.